Your flight departure will be from London. 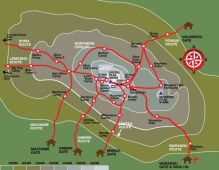 On arrival we transfer approximately 3-4 hours to our lodge accommodation situated near the village of Rongai, close to the Kenyan border on the northern slopes of Kilimanjaro. After freshening up we have a welcome lunch and meet our team of local guides who will be leading the Kilimanjaro climb. In the afternoon there is the chance to relax before the welcome briefing, given by your AC Leader, UK Doctor & head local guide - and a kit check. This evening we enjoy an evening meal together before an early night. After a good breakfast we make the short transfer to the Nale Moru Gate. On arrival we meet the rest of our Kilimanjaro team, including our guides, cooks and porters. 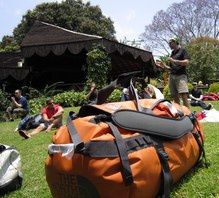 We register for the trek and our bags are weighed to ensure each is within the 15 kg limit. Finally it is here – the moment we have all been waiting for! We begin our Kilimanjaro trek through farm land and the pine forest that surrounds the local area. The forest then gives way to scrub and heather, and we have a very good chance of seeing Mongoose and smaller wildlife. Elephant and Buffalo have been known to cross the path that we follow, but we may only see their tracks, as the majority of their movements are under the cover of darkness. 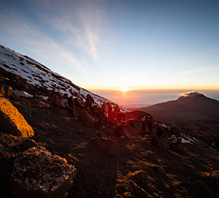 We have some short breaks and a packed lunch en route before reaching our camp in the afternoon; where there is some time to relax before dinner and settling down for our first Kilimanjaro night under canvas. Today’s route snakes through changing scenery, ascending up through heather and moorland towards the jagged peak of Mawenzi. In clear conditions the summit of Kilimanjaro itself is in view during some of today's walk. We stop for a hot cooked lunch at Second Cave Camp, before turning South East and traversing along a path that ambles through heath-land and rocky outcrops, with fantastic views of the Mawenzi, Kibo and the Northern ice fields of Kilimanjaro. After a long day, we retire to our tents just below the Mawenzi Saddle at the Kikelewa Caves Camp. Today can be tough for some, but it’s a great kick-start to acclimatising and being ready for our Kilimanjaro summit push in 4 days time. Today is an early start, continuing along the gentle path that soon becomes steeper. Your efforts will soon be rewarded by a hot lunch at Mawenzi Tarn, which sits in a bowl, protected by the ridges and spires of Mawenzi. An afternoon walk allows time to explore and get used to the altitude, before an early dinner. Though today is a short day, we are mindful of the altitude and so we travel at a very steady pace, allow plenty of time to snack and keep hydrated. The great news is that we are rewarded with a spectacular campsite, arguably the most scenic on Kilimanjaro, which will be our home for two nights. Today is all about acclimatising and resting. 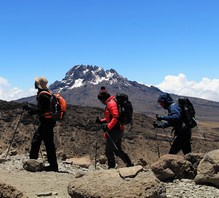 After a later breakfast than usual, we head off for a relaxed day of walking to acclimatise ourselves up to a maximum of 4500m on the North West ridge of Mawenzi. This is often a lovely day, enjoying time relaxing in an incredible mountain environment and wonderful comfortable camp. The afternoon is spent at camp relaxing, with stunning views over the Kenyan plains in the distance. Today is all about getting to our high camp, Kibo Camp, in as good shape as possible. That means walking at a steady pace, eating lots of snacks and keeping hydrated. We leave the stunning Mawenzi Tarn and head across the desert style landscape between Mawenzi and Kibo. It is such an incredibly vast and bleak area, unlike any terrain we would have seen so far. We travel slowly past the sight of a plane crash, where some wreckage is still visible. After 5-6 hours we reach our campsite at Kibo Huts Camp at the base of the mighty Kibo. In the afternoon it’s time to rest and eat before the final push to Kilimanjaro's summit later tonight! And so to Kilimanjaro summit day and our toughest challenge yet. We awake just before midnight and after a hot drink and snack we begin our climb. We climb for about 6 hours up the most demanding part of the route by torchlight, to reach Gilman’s Point at the crater rim. After a short rest we make our final traverse to Uhuru Peak, the highest point on the African continent at 5895m. The rising morning sunlight gives us spectacular views across the plains below and of Mount Meru in the distance and we feel on top of the world! 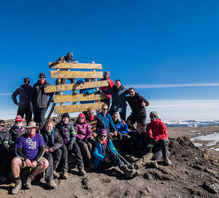 After some photos we have a tough decent back to Gilmans Point and then down to Kibo Camp where we stop for a rest and brunch before continuing on to Horombo Huts Camp at 3720m. After a long but exhilarating day we can finally rest our tired legs and get a good night’s sleep, perhaps one of the heaviest night's sleep you’ll ever have! After breakfast we continue our descent back through the rainforest to the Mandara Huts where we enjoy lunch. 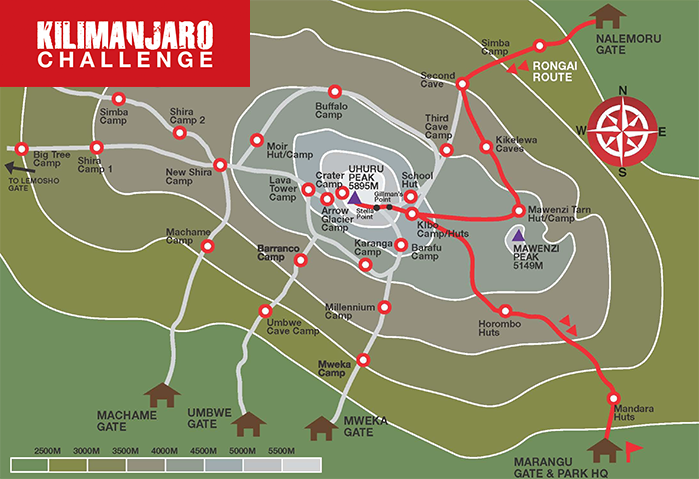 We then carry on down the track to finish our trek and leave the Kilimanjaro National Park through Marangu Gate. Today's descent is straightforward but after the challenge of the Kilimanjaro summit day we’ll have to dig deep. The great news is that the finish line and an amazing feeling of accomplishment is so, so close! A final farewell to our local Kilimanjaro crew, always involving some singing and dancing, has emotions running high. A transfer by bus takes us to our hotel. Here we can finally take off our walking boots and enjoy our first hot shower in almost a week! We have the afternoon to relax by the pool with a drink and this evening we enjoy a fantastic dinner to celebrate our remarkable achievements and for those who have the energy we can party in to the night! We can enjoy a free morning either by the pool or exploring the local area before transferring to the airport for our overnight flight back to the UK. 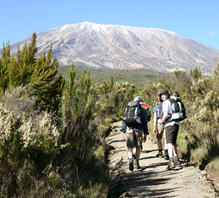 Please note: this Kilimanjaro itinerary is complex and may be subject to change.